By way of background, I have long history in the consulting space and believe that effective communications separates leaders from the pack. And it’s something that one can continually work on to improve. Over the years I’ve read a number of books on communications such as books on writing, storyboards, logic, presentation construction, visual design, and verbal delivery. I’ve recently read “The So What Strategy,” a book on business communications, and wanted to share my thoughts on the book. First, the book establishes a solid foundation from a structural point of view. The authors cover fundamentals from understanding one’s audience, the drivers for particular communications (e.g., context, triggers, and key question), bottom line messaging, and logical storyboards for key patterns that come up in business situations. The book also goes further to suggest concrete steps as to how one might incorporate storyboarding and other elements into both one’s own work and the internal processes of an organization. Second, the book is differentiated from other books, especially as it relates to addressing classic patterns one encounters in business. One classic book in consulting relative to communications is “The Pyramid Principle” by Barbara Minto (also ex-McKinsey). While Minto does a great job at explaining logical concepts that are pervasive in management consulting approaches such as mutually exclusive, collectively exhaustive (MECE) frameworks and tying these concepts to writing, Stanley and Castles dovetail with the same concepts and also cover seven classical storyline patterns that are suitable for business. These storyline patterns includes things such as communicating actions plans, suggesting recommendations, pitching ideas, providing updates, and several others. 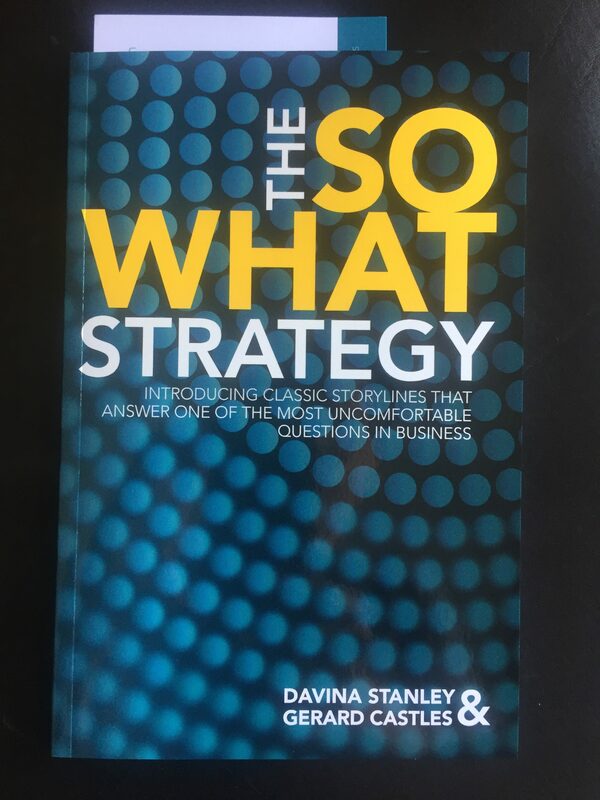 Finally, “The So What Strategy” comes in a modern package. While I feel the other two points I mention above are strengths, book’s package is one is the biggest selling points for me. First, for the time-pressed professional, the book is a very rich but quick read. I got through the book in about two hours, which is surprising given how rich the book is in terms of content and substance. And yet the book can easily fit into the messenger bag of a road warrior consultant. Second, the book has concrete examples of emails, storyboards, and presentations; this helps readers actually see where communications can be improved and how following the authors’ frameworks can help. Third, the book provides concrete tools (such as checklists) and is well-structured for being a quick handbook. I highly recommend “The So What Strategy”. Davina Stanley and Gerard Castles have done a remarkable job putting this book together. You can get a sample chapter on their website at http://www.sowhatstrategy.com.